Remember those guys ^^^ up there? 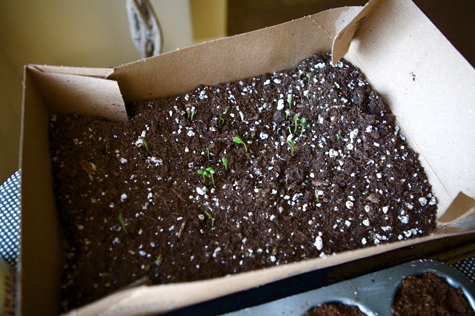 Those are the Zinnia sprouts that I featured when I wrote all about How To Start Seeds Indoors. Well, those little babies are growing up fast, and all of a sudden they’re outgrowing their acreage. See, it’s too cold still to put them outside just yet, but their current container is no longer viable. I began them in a shallow bed of starter mix, and now they need deeper potting soil for their roots to expand. 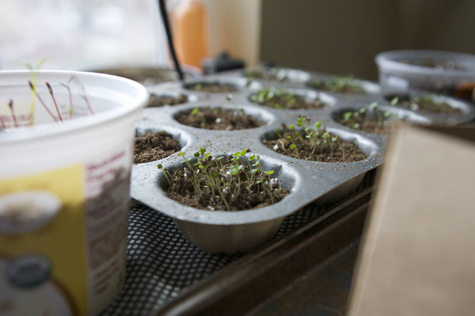 It’s time to move them, which I just love because it means we get to use the itty bitty minipots! So cute! 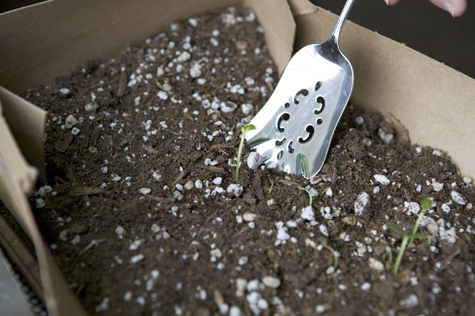 With a serving spoon or similar, dull-edged tool, gently loosen the dirt around the seedling you wish to transplant. 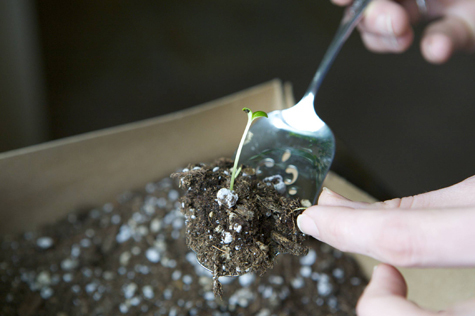 Carefully work the spoon underneath the seedling, allowing a wide berth around the stem and angling as vertical as possible to allow for maximum depth. Slowly lift the seedling and surrounding starter mix. 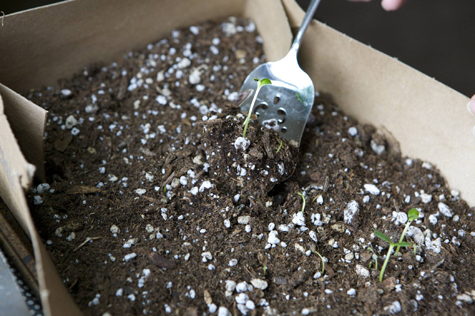 Using your most ginger touch, pick out any other seedlings or seeds that may try to compete for nutrients. 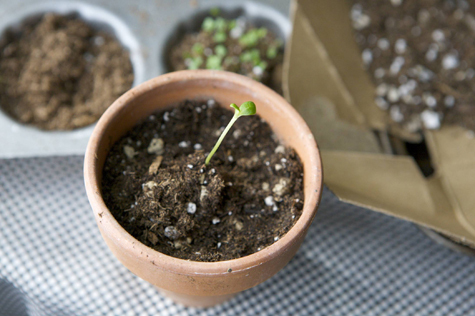 Gently slide your seedling clump into a pot that you have already prepared, filled 3/4 full with real potting soil. 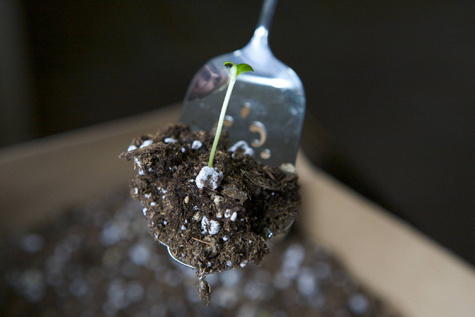 Just let the seed and starter fall off the end of the spoon to rest atop the soil. 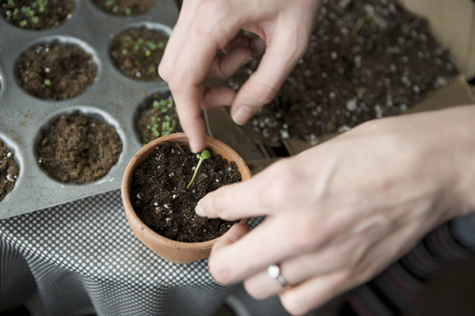 Using your fingers add more potting soil, covering the starter mix and the base of the stem – but not too deep! Lightly tamp down the soil. Lightly. 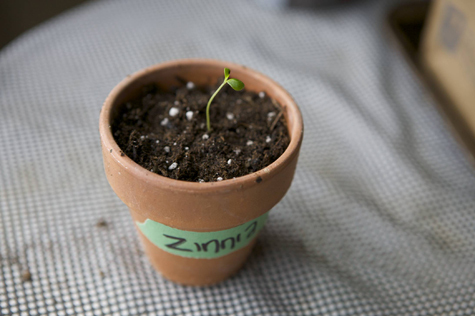 Give your new transplant a little watering, and don’t forget to label each pot. Return it to your south-facing window so that it can continue to flourish. 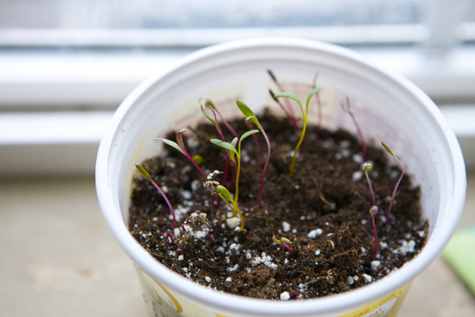 Then, stand back and marvel at the Ultimate Cuteness of baby plants in tiny pots! And what about you, my fellow farmers? 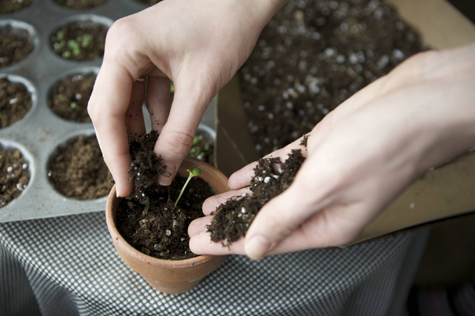 What are you growing for spring? I have pruning my garden on my to-do list for this week. The weather has been so unpredictable this winter that the basil didn’t make it, and the tomatoes & catnip need the deadites trimmed back. However, the onions, oregano, rosemary, and garlic are growing like MAD. 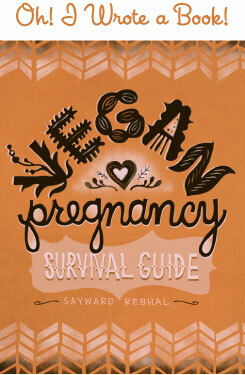 I desperately need to harvest the spinach & Swiss Chard, both are so overgrown and demanding to be eaten! @ Sam – I am uber jealous of your ability to year-round garden! You overwintered tomatoes and herbs? Gah! Not fair! HEIRLOOMS! I love heirloom seeds. I have 11 different tomatoes, 5 kinds of peppers, 4 kinds of cukes (including a white cucumber that I am uberexcited to try), baby eggplants that are going in the container garden on the deck, beans, shiso, 2 kinds of basil (the standard large-leafed and lemon basil), onions, carrots, beets, red celery, half a dozen kinds of berries and maybe even a small vineyard if I get around to it this year, lamb’s quarter, pepper cress, and borage for salad greens, cilantro, and chives. Whew! Oh yes, and I started pots of catgrass (mixed greens; barley, rye, wheat, and oats) for the cats. Turns out Madeleine might as well be a vegetarian — she keeps DESTROYING it. Good thing those little buggers are hardy and grow fast! I’m planting more this week. @ Kat – Oh my goodness, I am in awe of your garden bounty! And all those heirlooms, it sounds amazing!! I too plan to make all my own salsa and can it this year. Do you know a good recipe? Good luck with the growing!